Consider a marketing environment where an imperfection isn’t a deal-breaker – stages become sprints, market research become prototypes, and uncertainty becomes opportunity, writes Neil Shewan. Are you launching a product or service to an audience you’re 100% familiar with? Do you know how they will use it and have a complete understanding of what your competitors are doing? Not to mention, knowing how technology will impact it over the next few years. You do? Then stop reading this article. If you are like the majority of businesses, you are operating in an environment of extreme uncertainty. At best we can only hypothesise about who our audience is, and how they will use our products and services. How does marketing operate in this environment? By the time our product is ready to go to market with our traditional ‘Hollywood launch’, we have invested a huge amount of time and energy. We then cross our fingers it will work based on our best efforts. In extreme uncertainty we need to change the model to one that will allow us to validate our hypothesis, pivot our strategy before we have spent all of our marketing budget, and create a stand-out product or service. For those that have read The Lean Start-Up by Eric Ries you will have an inkling of where this is headed. Ries suggests we look to the practices of organisations such as Toyota in the manufacturing space, and Google in the digital space, to embrace a cycle of learning, building and measurement. This process starts by defining the minimum viable product (or service) to go to market. This product does not need to be 100% perfect. ‘Not perfect?’ I hear you say. Yes. Not perfect. The goal is to spend as little as possible to get the minimum viable product or service out to market for early adopters to provide feedback into the next iteration, and to validate your hypothesis on price, product and promotion. For those in brand management this concept is hard to grasp. If it is not a good product, won’t it damage our brand? The reality is that given the alternative of your product not hitting the mark after spending thousands, sometimes millions to develop and launch it, then the brand will be hurt even more. Early adopters are quite forgiving if you involve them in the process of early development through iterations and/or regular releases. Let them tell you the issues with the product; let them help you make it better, and you will have developed the beginnings of an enduring relationship. It means you need to consider a lean approach to marketing doing just enough to test your initial assumptions. This may start with selling the idea and getting feedback. We adopted this approach with Australia Post’s MyPost Digital Mailbox. The minimum viable marketing consisted of a short concept video and a one-page website to gather interest in the product. 16,000 registrations later, we had confirmed there was interest, and Australia Post had a list of early adopters to work with. Australia Post was able to test assumptions, refine the product over many months, then confidently launch to a mainstream market with the best possible version one. 1. Be specific about your hypothesis. Create a persona for your audience, understand how they will use your product/service and continually test and refine your hypothesis. 2. Be ready to pivot your strategy. If something is not working, be open to change any part of the marketing mix to test and refine. As you have adopted a lean approach it is a lot easier to change direction. 3. Keep it minimal. Don’t spend spend months designing a logo and coming up with a name for the product when you don’t even know your assumptions are correct. Be happy with simple, functional design, and divert your attention to getting feedback and iterating the next version. This approach to marketing requires a synergy with your creative agency, and a relationship that is different to that we have come to know between agency and client. Stages become sprints, market research become prototypes, and uncertainty becomes opportunity. If you are faced with a marketing challenge where there is extreme uncertainty, consider starting by delivering the minimum. 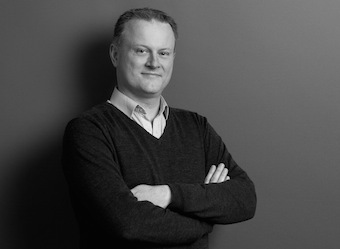 Neil Shewan is managing director at creative agency, TANK. His team innovates on a broad range of brand communications challenges for clients. Clients include start-ups working in their garage, through to multinationals and governments.